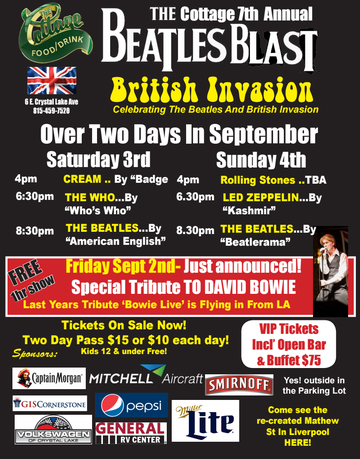 The Cottage 7th Annual Beatles Blast British Invasion Concert 2016! Family-friendly event! 8:30 pm AMERICAN ENGLISH- The Beatles cover band!!!!! This year we've added a special (just announced) concert on Friday Sept 2nd!!!! We are bringing back last years David Bowie tribute to do a FREE one hour concert.. just to start the weekend right :) It will be a solo one hour performance in honor of David Bowie.. FREE because we don't want anyone missing out ! There will be food, drinks and fun for the whole family set up in our parking lot! Face Painter and bouncy house for the kids!